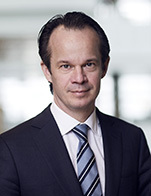 Jacob Meldgaard, born in 1968, has been Chief Executive Officer of TORM since April 2010. Before this, Mr. Meldgaard served as executive vice president and member of the executive management in Dampskibsselskabet NORDEN. Prior to that he held various positions with J. Lauritzen and A.P. M�ller-M�rsk.